I am a newbie, and I just bought an M3 without functional AC. All of the parts are there, but there is clearly a leak somewhere. 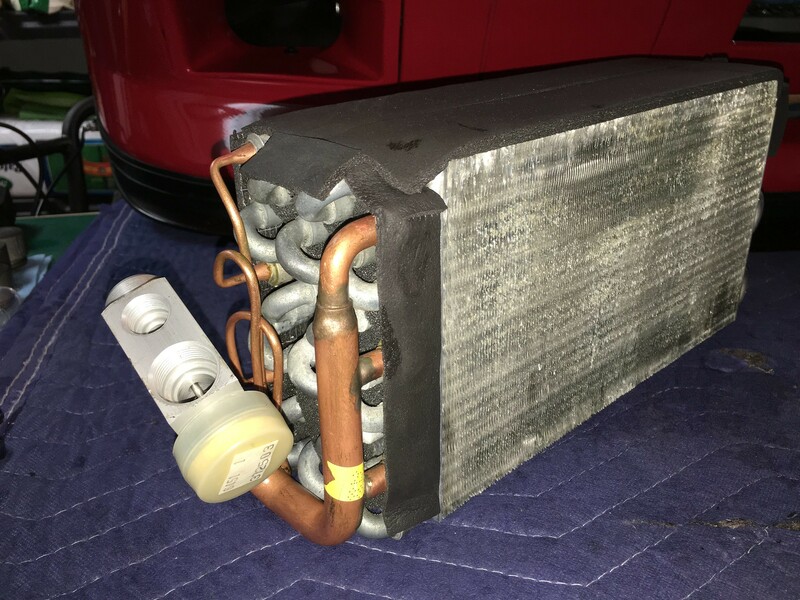 I know that it probably uses R12, now my question to the folks here, should I repair the AC and continue to use R12, or upgrade the whole AC to use R134? Any recommendations with pros and cons would be appreciated? Also any recs for AC work within the Boston area? I converted mine to 134a using a kit that BMW sells. The kit uses a new condenser and new green o rings. My compressor was not upgraded but it works ok. Not as cold when it used R12. Nice thing about 134 is you can pop down to pep boys for a refill. Lol. Is the M3 compressor compatible with R134a? Anyone know the part number for the M3 compressor?? You can purchase all of the hoses new, but it's not a plug and play. Many of the hoses have the wrong bends or are too long/short and require modification. If you're willing to put in the time and effort and spend the extra money on hose modifications, I say go for it. If not, there isn't any reason you can't replace the receiver/dryer, flush the system, and refill it with R12 you buy from Craigslist. Definitely use all new HNBR seals that are compatible with R12 and R134. They're the green ones and you can buy assortment kits with hundreds of o-rings of all sizes from Amazon. You can *probably* use your existing compressor with R134, but I'd recommend sending it away for a rebuild/reed valve replacement and thorough cleaning to remove all of the mineral oil. 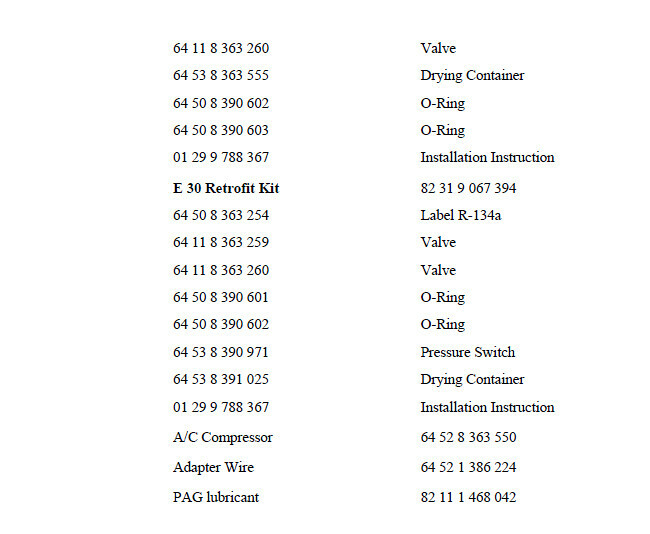 R134 uses PAG and it not compatible with mineral oil. Some people do it and have good luck. Others end up with a seized compressor. 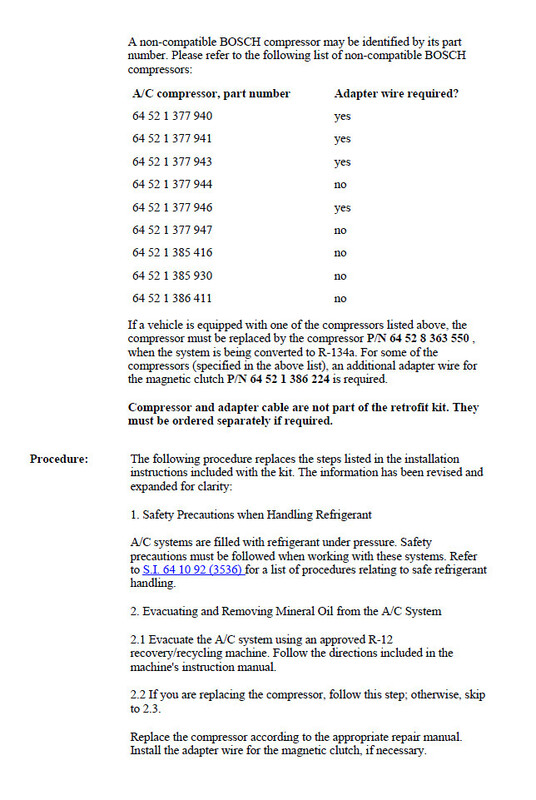 The guide below says what compressors are compatible and which are not. I'd follow the list. 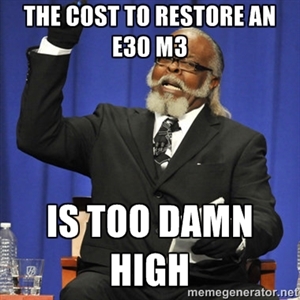 Here is a R3V thread on the E30 R134 conversion. 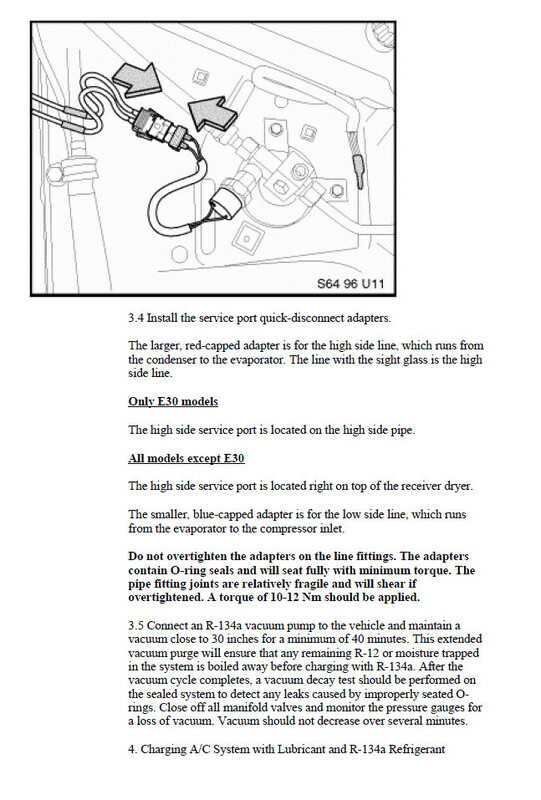 In this thread, the "new" incorrect hoses are not replaced, and they are using the original R12 hoses with an R134 fill adaptor (that also comes in the below referenced kit). 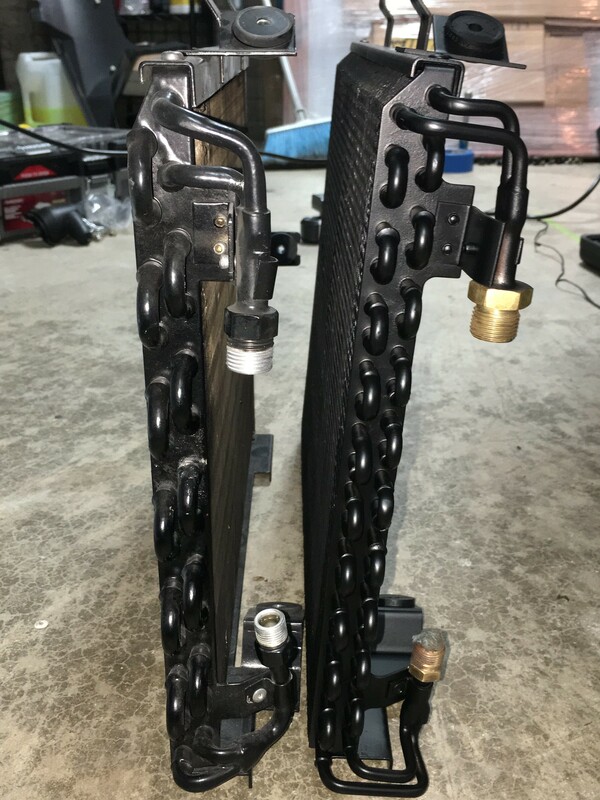 I'd also definitely do the new condenser because the parallel flow are designed to work most efficiently with R134 vice the original condenser. They are cheap and actually very easy to replace. I do not see an R134 expansion valve in the kit - it's critical that you replace the R12 expansion valve with the R134 unit. They're $25 for the Rein brand, whereas the BMW dealer price is $108. It will come with a little plastic cap with some fiberglass in the end. It's not packing material - you install the EXV with this cap on! Here are some pics from my recent AC system work. I flushed the system, bought a proper R12 condenser and refilled with R12. Last edited by Brandon; 07-26-2016, 08:13 AM. 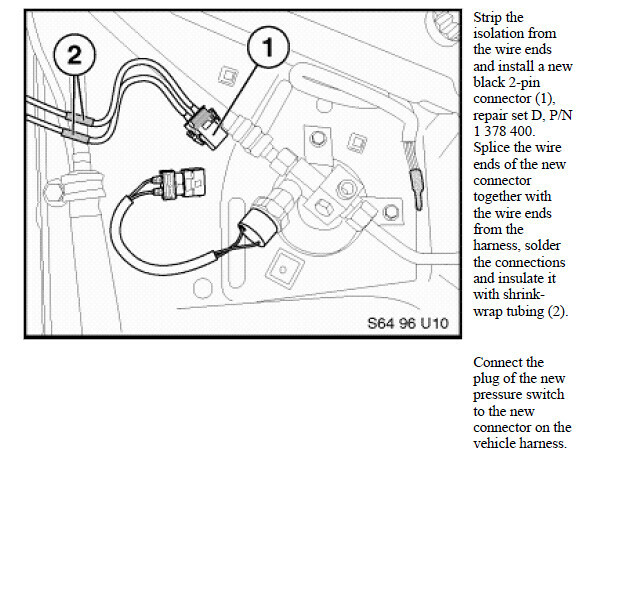 Why do the instructions say that for e30's with separate high and low pressure switches, you should cut off the plugs shown and solder together? Is the new switch a dual pressure switch? 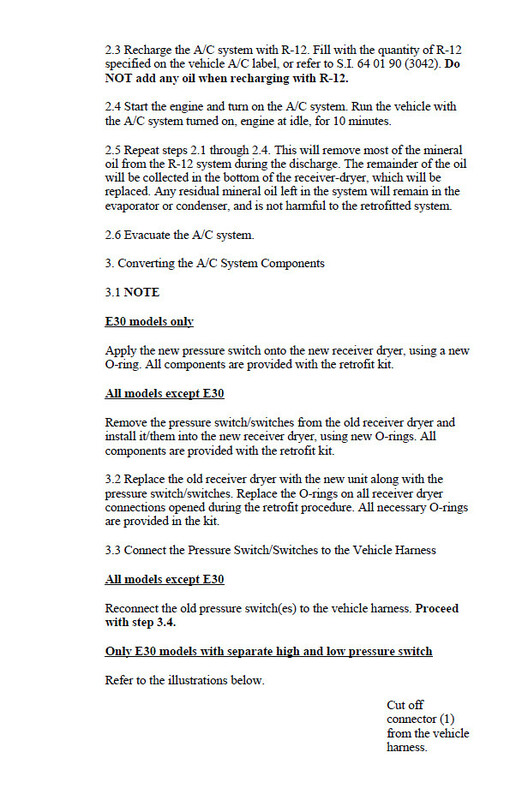 I recently had my car converted to R134 with new evaporator, expansion valve, dryer, and seals, but used the same high and low pressure switches. It gets cold but cycles sometimes when its hot outside (100+), just as it starts getting nice and cold lol. Does R134 operate at different pressures than R12? Run R12E. Totally compatible with the R12 system, but propane based. The stuff is cheap as well. Its sold under the Enviro-Safe name. It runs less pressure than R12 or R134. 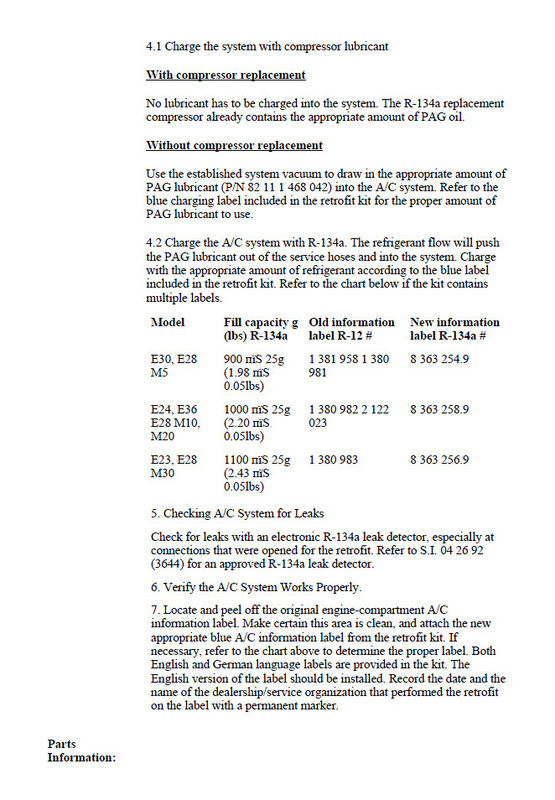 Posted by Chucker: "Will, you wont have to do anything more than pull a vaccum and charge with ES 12a refrigerant. Its mixes with all oils. It doesnt draw mositure if you ever have a leak, it just leaks out... No risk of black death as with freeze 12, r134a crap. its more effiecient than r12, freeze 12, r134a, etc... You barely feel the compressor kick in. And did I say blows cold. I put a parallel flow on last summer when I got all that freeze 12 crap out and its cold brother, probably 38 degrees. way cold in asheville, nc. From the sound of that, I'd say its totally compatible. 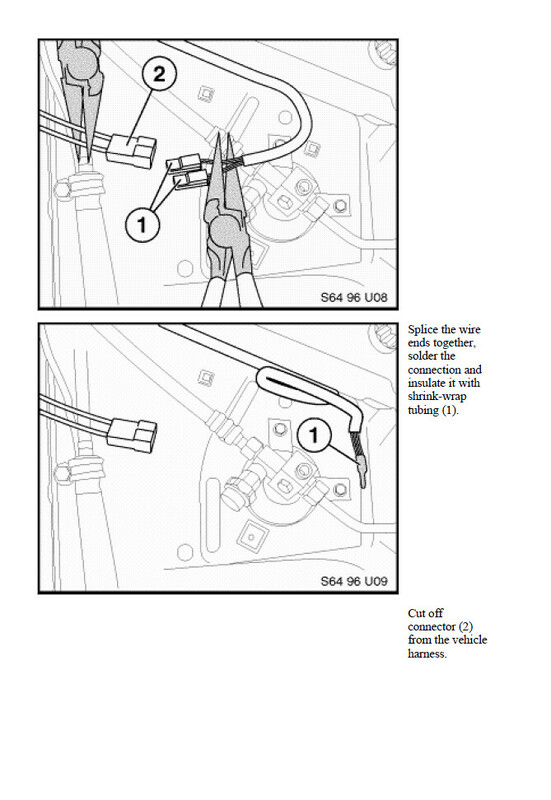 I'm about to order some and try to resurrect my system after I swap out the drier and leaking pressure switch. I have a new one, but its only got one pressure switch instead of two so I will have to do the wiring mod listed above. I am currently using a R12 compressor and original condenser. All that was changed is the o-rings, drier, and expansion valve that come with the R134 retrofit kit. It is running cold. The original 44-tube condenser ought to be fine, but the parallel flow unit was designed for use with R134 and is more efficient. You can't go wrong swapping it out for $79 should you ever need to get back into the system. 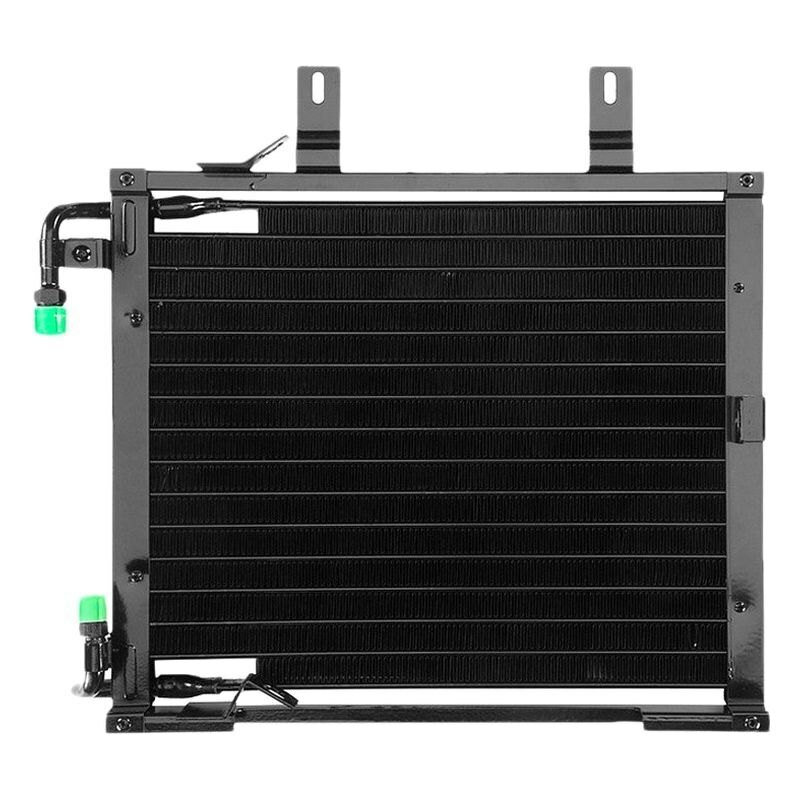 The OE condenser you can buy from BMW now has half the tubes and half the surface area by which heat can be exchanged. I bought the original 44-tube off of eBay because you can only buy them used now. 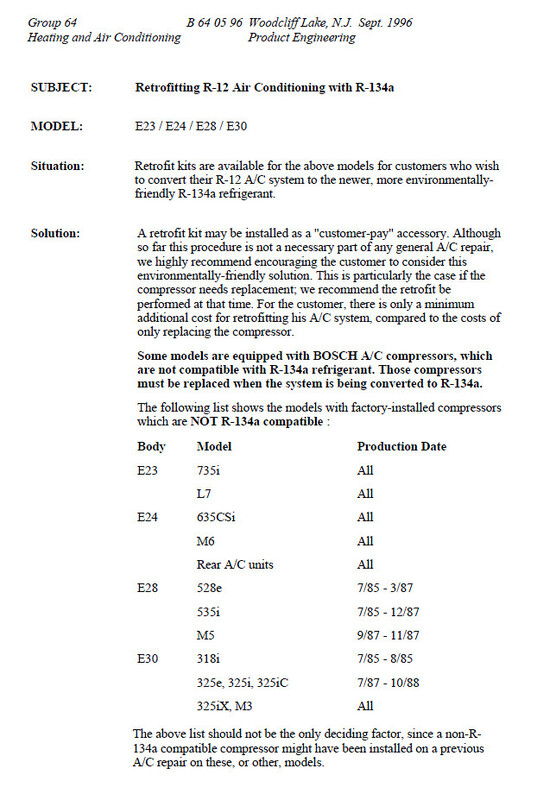 Some R12 compressors are compatible with R134, per the list above. As valuable as the compressors are, I would rather sell a non-compatible R12 compressor to another M3 owner still using R12 and buy a proper compressor. Last edited by Brandon; 07-27-2016, 04:43 AM. No worries man... are you having fitment issues or is everything sorted out? No issues. Bolted on perfectly. Enjoying the AC because it is 98 degrees in the bay area! Whats the purpose of the cap on the end of the expansion valve? I noticed mine doesn't have this installed. Can I just wrap the end in that tar-like insulating tape? I'm not 100% certain. 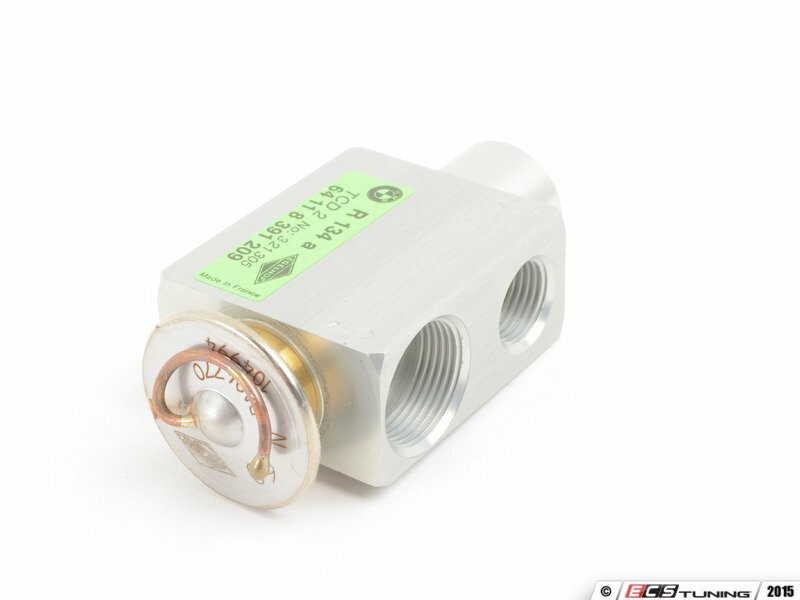 I've read the sealed bulb end part has liquid R12 in it and it needs to be shielded from quick temperature fluctuations to operate the expansion valve properly. Ok, that makes sense. I can't find the cap separately, and it seems to be working pretty well so I don't think I'll worry about it. If i get in there again sometime ill just wrap that end with some ac insulation tape.